How Does Domain Name Escrow Work? $5,000.01-$25,000 $162.50 + 0.26% of amount over $5000 Not available. If a domain name were selling for, say, $1,000, the fees charged by Escrow.com would $32.50 for Standard service and $63.00 for Premier service. 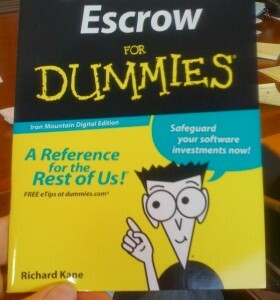 (Escrow.com’s services are defined here.) A $200 domain name sale would have an Escrow.com cost of $25.00. Fast or Instant Transfer: Many after-market domain name sales companies offer the ability to quickly or instantly have the domain name transferred from the seller to the buyer upon payment. In this case, the seller hosts or lists the domain name with a marketplace, the buyer creates an account with the marketplace, the transaction is agreed upon at the marketplace, the buyer makes payment, and the domain name is instantly transferred. Afternic offers an instant transfer; Go Daddy Auctions didn’t have information on their website, but upon speaking to Ivan by telephone he said that the process of buying a domain takes a few days to a week and is “pretty much guaranteed” that you’ll get the domain name if you pay the money. An Attorney: An attorney can help you draft a sales contract that clearly outlines the purchase agreement. A default by the other party, however, leaves you with either filing a suit in court, or seeking arbitration. In other cases, you can write the contract to state that the defaulting party pays the fees of the court or arbitration. An attorney can also escrow funds from a buyer and only disperse the funds to the seller until mutual agreement of services are rendered to buyer. Different companies may provide different services related to domain name escrow. Both buyer and seller should make sure that agreed escrow process provides a clear fee structure, step-by-step confirmation, and guaranteed transaction timeline. We are selling a few domains actually for the first time, but we are really afraid using Escrow service WITHOUT the “concierge” mode (100$ fees !). We’ve read that in case of the buyer create a dispute, he will be automatically refunded within 14 days ! and we loose the domain because it has been transfered. We really fear to be scamed. Is there any case like this ? How often ? Do we have to use systematically the “concierge” mode transaction ? Or the standard transaction mode is safe enough ? Thansk for sharing your experience ! I think domain escrow is a great idea if you are selling a name and it helps the other party feel better and trust you more. Very useful summary. It’s been unclear to me up until now. Thanks for the domain name escrow examples.